The right seating arrangements can be just what your outdoor space needs to feel more comfortable and enjoyable. However, there is no one-size-fits all solution. Developing a solid and functional outdoor seating arrangement is fully dependent on the space you’re working with, your personal style, and what aspect of your space that you would like to emphasize the most. With that in mind, here are ten outdoor seating ideas that should work for your type of outdoor setting. 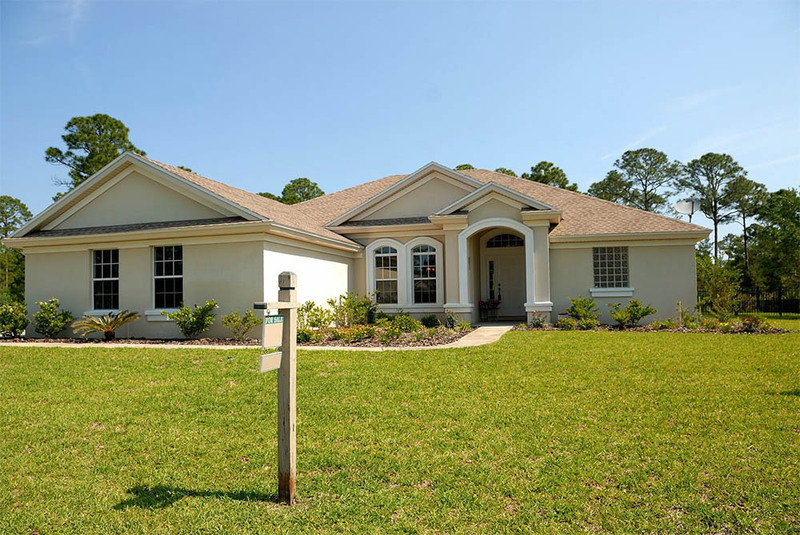 If your outdoor pool is the main feature of your backyard, consider including a spot for sunbathing, shaded lounging spots, and a dining area. 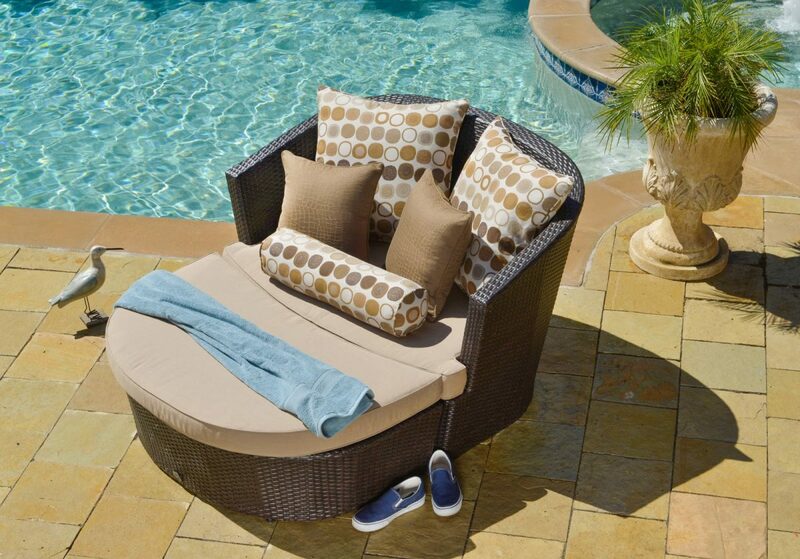 For sunbathing, try adding wood or wicker chaise lounges near the pool. These are not only more comfortable, but make it far easier to enjoy the sunshine while getting a tan poolside. In a naturally shaded area, add some lounge chairs or benches where guests can sit or keep their belongings, like their towels and sandals, while they enjoy a nice dip in the pool. There are few things more enjoyable than a spectacular view from your own backyard. 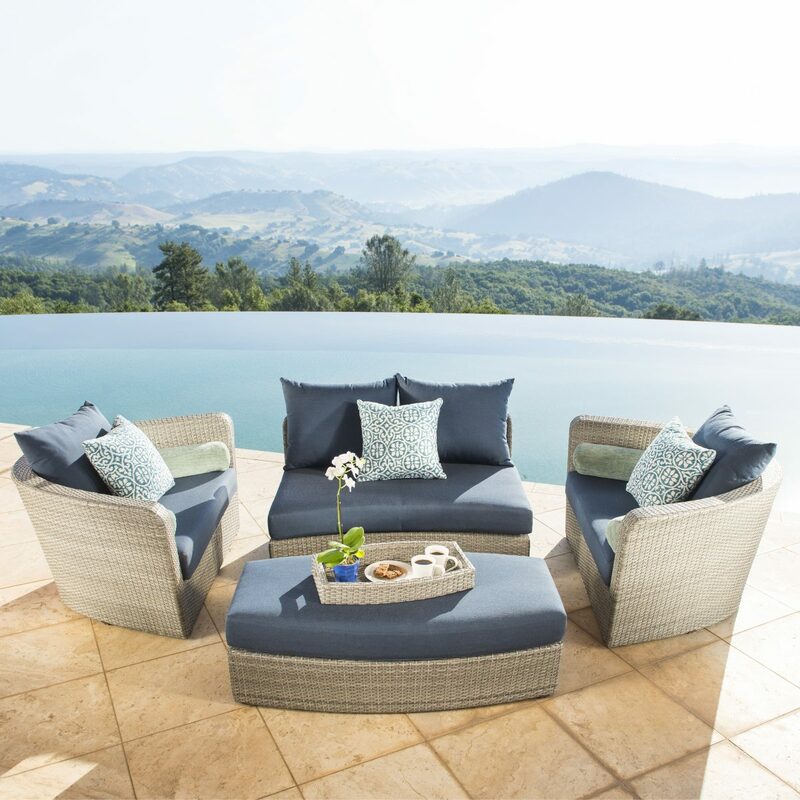 Consider seating that points you and your guests right toward the gorgeous view you are fortunate to have, or have that view serve as the backdrop to all your eventful nights outdoors. 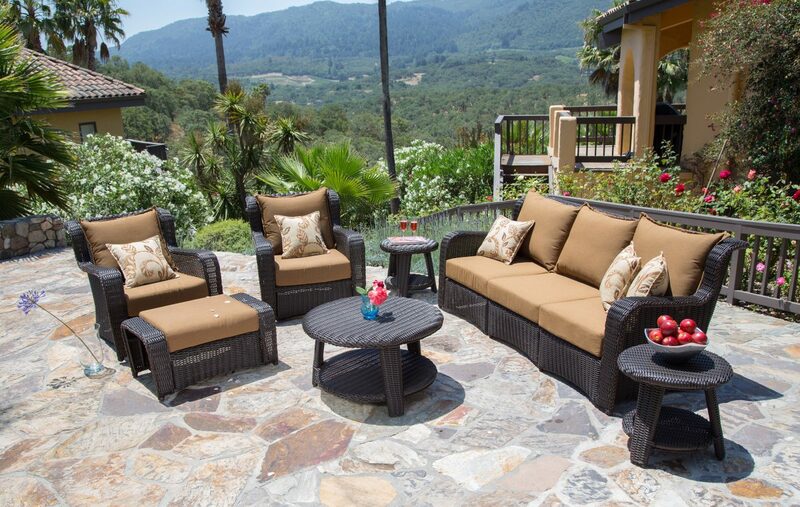 Place your furniture in an area of your backyard that best highlights the view. Perhaps you have a great open space with tons of greenery or an awesome view, and would like some shade to cover your entire seating area so you could better enjoy the space. While we love incorporating patio umbrellas, sometimes they aren’t enough to provide the ample shade we need for our outdoor space during the hotter months. 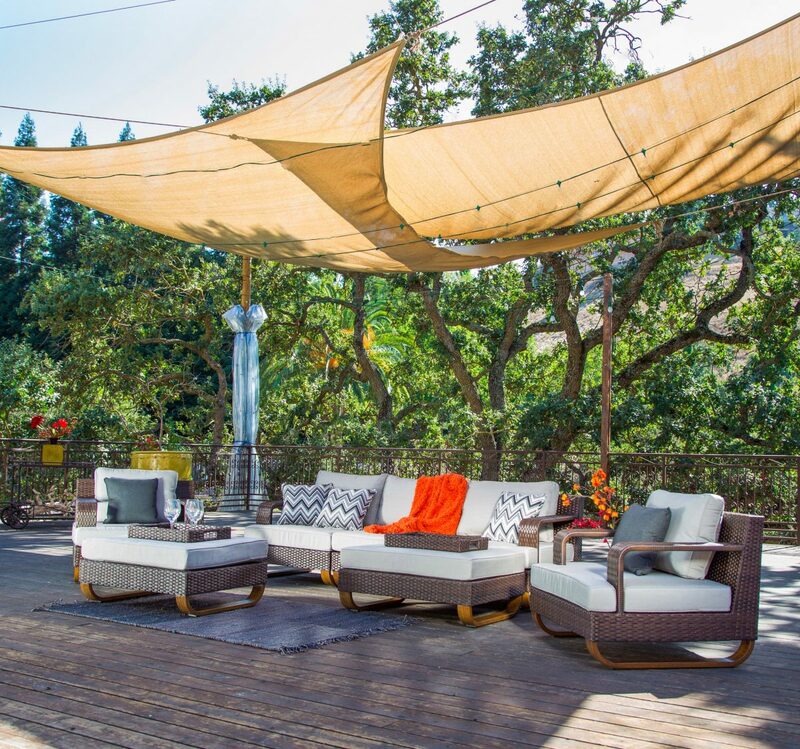 Try hanging a canopy or two to keep the space nice, open, and airy, while providing the perfect amount of shade over your entire outdoor entertainment area. Take the ambience up a few notches by incorporating string lights to create the best mood lighting when the sun goes down. Add bold pops of color with your favorite flowers and outdoor accessories to contrast all the amazing greenery surrounding your space. When sprucing up your seating arrangements in any type of outdoor living area, consider how much space you have. 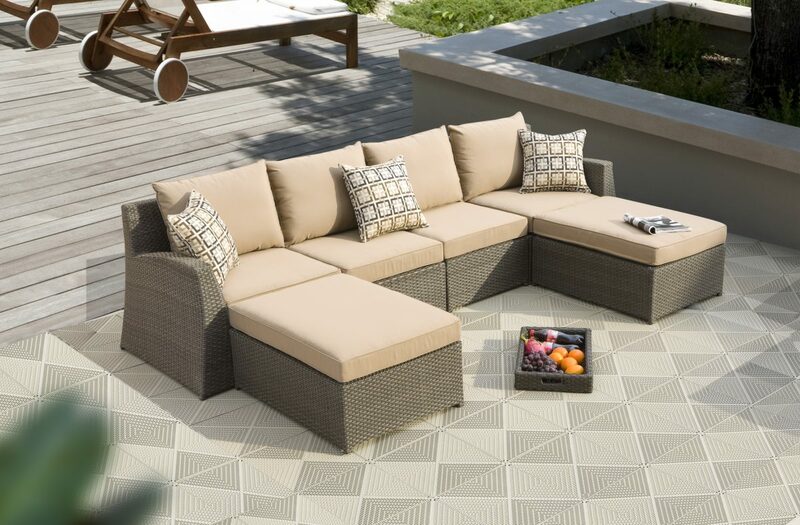 For those with larger spaces, a multiple piece modular patio furniture set that can be assembled and arranged into different pieces or one large sectional is a great option. 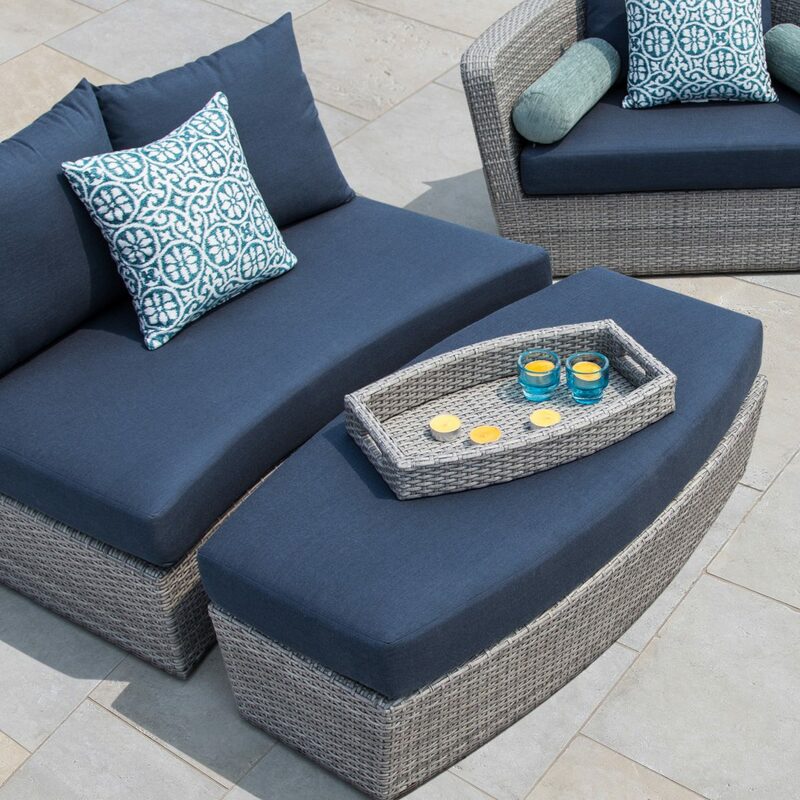 If your outdoor space is much smaller, a modular seating option is ideal. Like a larger multiple piece set, you can arrange this into multiple pieces or combine it into a bigger statement piece. The functionality and style that modular seating sets bring into a space are worth the investment. There’s something to be said about the classic deck patio. However, you don’t have to make this look or feel like a generic, outdated space. Patio tables and chairs are, of course, a must, but you can throw in an outdoor patio furniture set to better fill up your space. 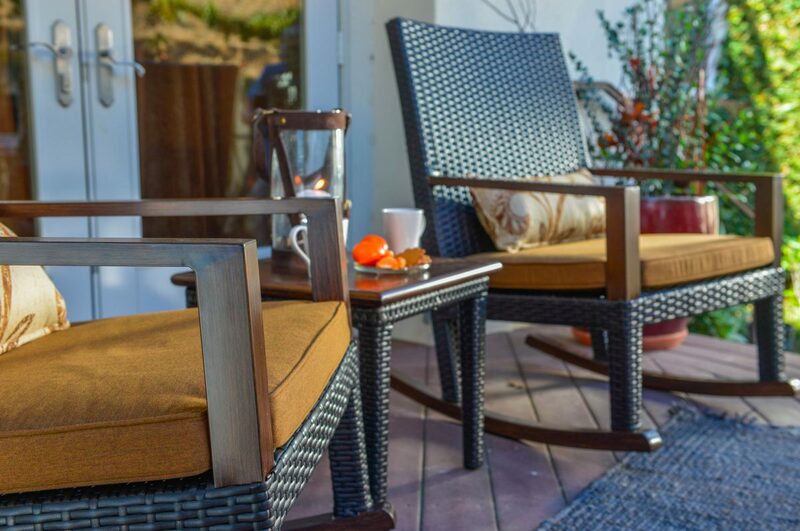 You can rearrange your patio seating sets and create different seating areas on your deck if your space allows. Add a large outdoor rug and have different types of seating in different areas to really divide the space up nicely. Spruce up the deck with potted plants and shrubs to bring in a relaxing, nature-focused feel. The beauty of outdoor fires is that they can be enjoyed year-round. 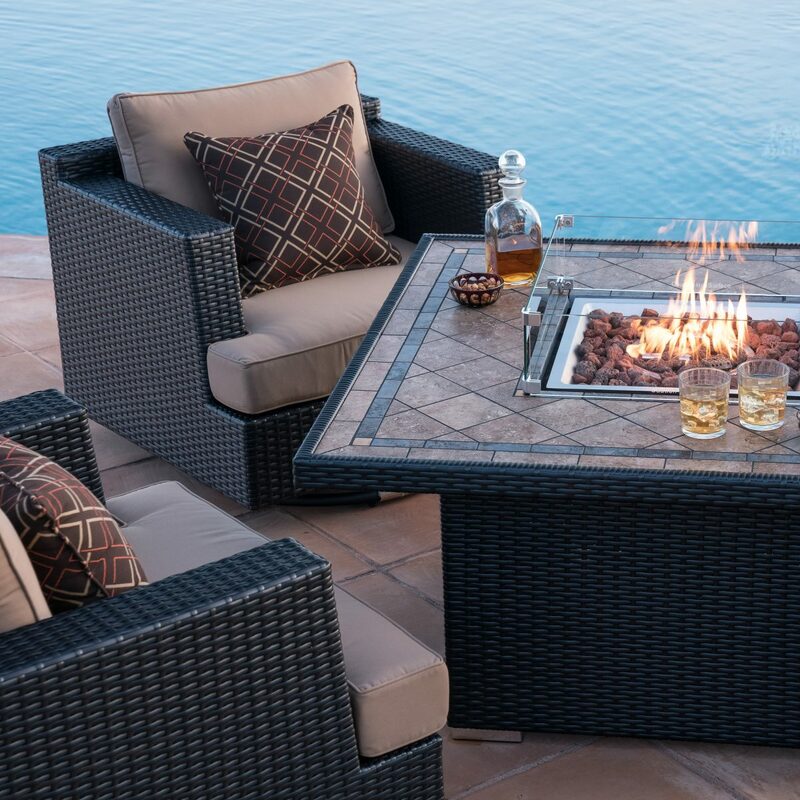 Outdoor sofas facing an outdoor fireplace are always a great idea, but if you want something more intimate, try sitting around a small fire-pit or fire-table. Darker, deeper, camp-like colors, such as deep reds, browns, and grays are a good match for your outdoor fireplace, and really make the seating area cozy. Wine and dine around the fire-table while you watch the sunset with your closest friends. When the grill or outdoor kitchen is essential to your outdoor space, you’ll need adequate space for large serving trays and food. For those who want to entertain for larger crowds, the 5 piece patio set just won’t cut it. Long, outdoor dining tables with benches or multiple chairs are your best bet. If you usually host large parties, consider getting two dining tables for extra seating or to create one giant long table for your guests. If sunlight is a concern, consider surrounding the area with a large patio umbrella that can help keep out the sun while also freeing up precious table space. Smaller outdoor areas of your house often get ignored, but they can easily be transformed into a peaceful retreat. The classic porch swing has not gone out of style, so consider this a great addition to your porch if your have the space for it. 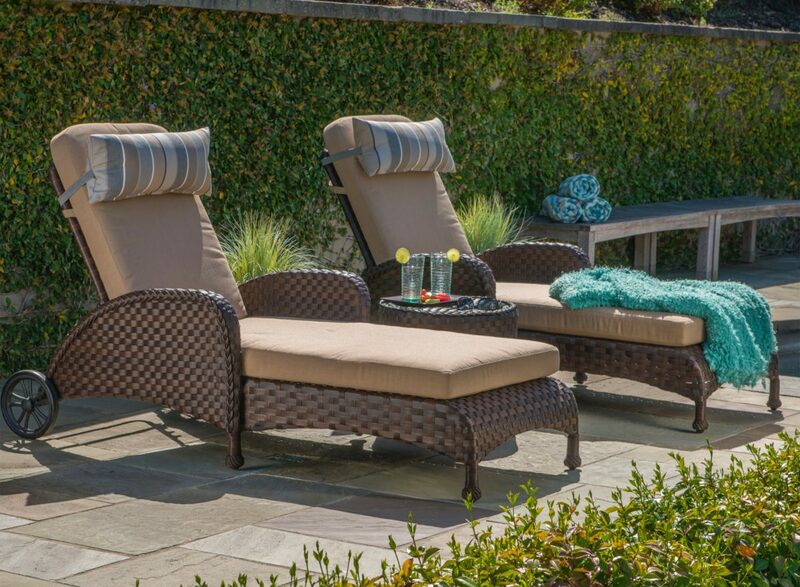 For those who want to lounge a bit more and swing a bit less, wicker chairs can easily make this your favorite spot to enjoy the warm spring afternoons and cool summer nights. Rocking chairs are also a good middle ground between the wicker chairs and the porch swing. You’ll get the best of both worlds without taking up too much space. Add in a coffee table for your favorite evening tea, coffee, or wine, and don’t forget to incorporate your favorite plants into the space. Love escaping to the napa vineyards or Italian countryside? Transform your courtyard area into a rustic getaway your friends and family will talk about and return to again and again. Surround your space with natural stoned pavement and a lot of lush greenery. Having wicker furniture sets with cream, brown, or rust colored accessories can help eliminate any pretense that is often associated with a more modern feel. Focus on good company and good conversation over some chilled wine in your backyard getaway. 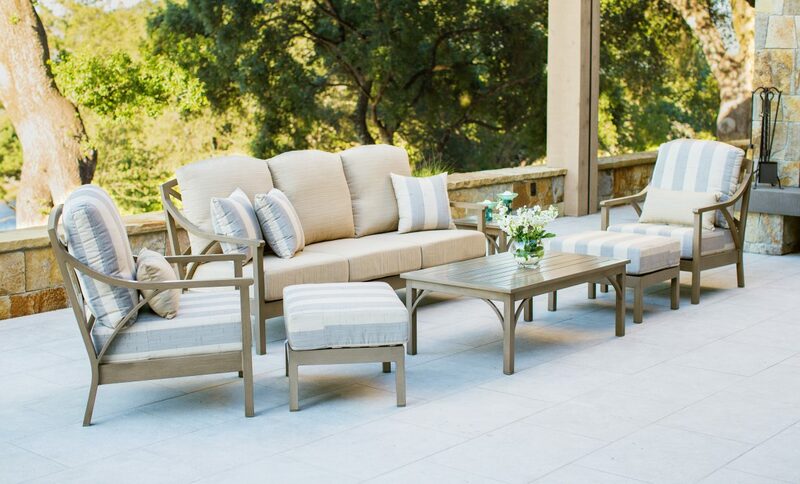 Create a timeless feel on your outdoor terrace with quintessential seating accommodations for your favorite house guests. Minimalism is the key, but while this is a more classic design, you can get creative with the types of colors, furniture, accessories, and prints you choose. 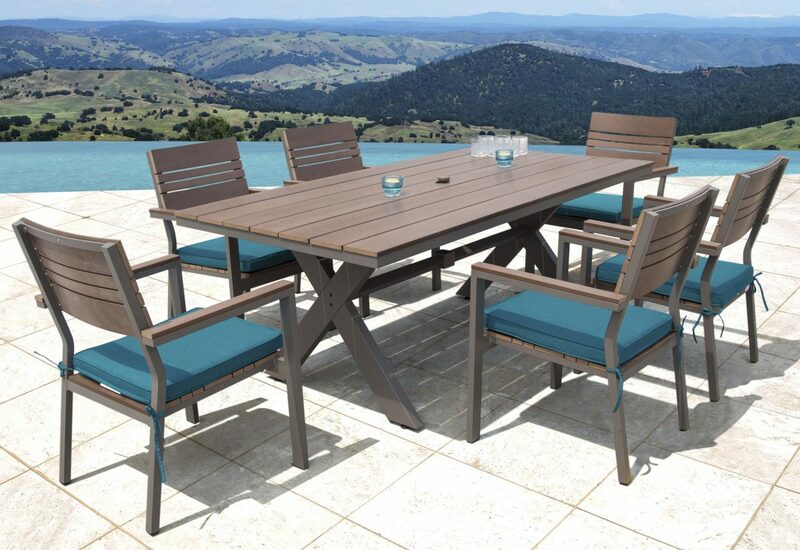 Pick a luxury patio furniture set that complements the natural colors of your terrace and pieces that have unique architecture incorporated into its design. Whether you’re entertaining guests on your terrace or relaxing by the outdoor pool, your seating arrangements can easily make or break just how well you and your guests enjoy the setting. Any outdoor space can be arranged in such a way as to maximize available space without sacrificing style. Even if all you have is a view, you can use creative ideas to turn the simplest and smallest spaces into an easy, relaxing getaway. ← Starsong Giveaway: Enter to Win an Accent Chair for Your Home or Office!